Part of the ethos of microadventures is that they are not prescriptive. This leaves scope for people to interpret them however they wish and come up with novel ideas of their own. This is why I generally avoid putting maps up for any of my trips. However, I appreciate that for those living in big cities, it can be a difficult thing to dream up a first microadventure. Surrounded by city it is hard to imagine that not far beyond these towerblocks and dark satanic mills lies a green and pleasant land. Places where you can hear birdsong and little else. Where you can watch the sun set all the way down to the horizon. Where -hopefully- you have no phone reception. So here are a few suggestions of places to head for if you live in London. Leave work promptly and dash for the train. As May approaches the nights are getting longer so it’s pretty easy to reach all these spots in time for sunset. Climb a hill with a friend or two, sleep on the top, and be back at your desk recharged and amused by 9am the next morning. I have been deliberately brief with these suggestions allowing you to do most of the discovering for yourself. Rest assured that the hard part is only getting yourself motivated enough to jump on the train. You’ll figure the rest out! Marylebone: train to Wendover. 48 minutes. Head along the Wendover Arm Canal, down the Icknield Way or into the Wendover Woods. Or go mountain biking at Aston Hill. Paddington: train to Henley-on-Thames. ~60 minutes. Follow the Thames path either upstream or downstream. Head for Remenham Wood. Or go armed with a packraft and you could paddle back to London! Victoria: train to Amberley. 1hr 25. This is quite a long train ride (there are nice places nearer along the same line). But the South Downs here are really lovely and a chance to get up high. Chanctonbury Ring is about 10 miles away. Or explore the atmospheric river Arun. A quicker option from Victoria is to take the train to Otford (~45 minutes) and explore the woodlands high up to the east of the village. Liverpool Street: train to Sawbridgeworth (~45 minutes). Follow the river Stort out of town into some pockets of peaceful farmland. If anyone can compile a similar list for microadventures close to other cities I’md love to hear from you and add them to this site. I live in inner city London, in the east end and work in the centre. About as far from “adventure as it’s possible to get”, however, I’mve had some great microadventures. One of the highest spots on the South Downs. I work near Farringdon, so can jump of the Thameslink Train towards Brighton. Get off at Hassocks, about 45mins, then a 30 minutes walk up the hill. Great views over to Brighton to the south and watching planes head to Gatwick to the north. It’s also perfect for watching the warm air come in off the coast and hit the land and fog appearing to pour like water over the Downs! Take train from Fenchurch St towards Southend. Get off at Leigh on Sea after about 45mins. Walk about 30 minutes West to Hadleigh Castle (possibly via Old Leigh to get chips!) Sleep in a ruined castle overlooking the Thames Estuary. Luxury! You get to tell your colleagues you stayed in a (ruined) castle the next day! I don’t apologise for this being an overly London-centric blog. I hope that what it shows is that if you can do microadventures like this close to enormous, crowded London which lies so far from any decent wilderness then you can definitely do them where you live! 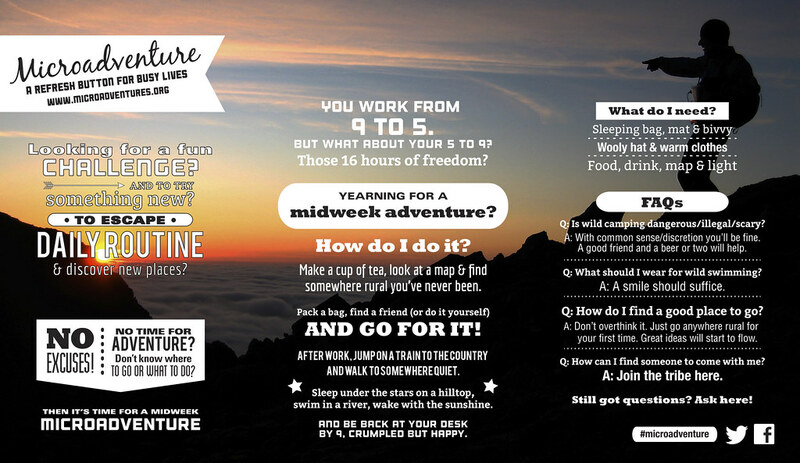 Now use this infographic to actually make your microadventure happen! Walk West out of the town, following St Swithuns Way for nearly 7 miles, through Chawton and Four Marks, before bedding down for the night in Old Down Wood. Cycle out of Haeundae heading East up the coast. 7km, hit the beach and inflate packraft/go for a swim to the headland (around 1km). Cook noodles and watch the sunset. Bed down for the night on the headland. would you be interested on anything in Brazil? I live on a farm at Saquarema near Rio, with a wild camp site so there’s one, around me our mountains with plenty of place to just camp, lots of small farm some with expats, I often see tents on the beach at New Year and lots of rural areas I could research for you plus I go up the mountains above Rio, which will have some fabulous places for wild camping. Let me know and I’ll do some research. You have a great attitude I’d like to help. – Cycle to the Silent Pool between Shere and Albury for a swim. The water is fed by springs that run over chalk so it’s very cold and very clear. – Walk from Dorking to Gomshall through the Denbie’s Vineyard along the North Downs Way. – Bivvy along the North Downs Way or in the woods around Abinger Hammer – some lovely spots overlooking an old quarry with views over Surrey. If you don’t need to be at work the following day, you can go from London Kings Cross to York in 2 hours. Book your bike on too and ride out of York to the north. You can be at the bottom of the North Yorkshire Moors in a couple of hours or so of scenic riding! Do it in late June to ensure evenings light until after 10pm. We have big skies up here! You could have a micro adventure without even riding the train. Take a bike and head east on the southern Thames path all the way out to the Thames Barrier. Further east you go the quieter it becomes. As the river gets wider, the mix between old and new, glassy buildings and old wharfs becomes sharper. Very interesting and some great photos to be had on a sunny evening. It is peaceful at the Barrier. Back in time for a pint before bed. Used to make my way from Golders Green to the North Downs Way almost every other weekend for a good hike. Took a while some days but was worth it just to have a break from the city. Really like the thought of paddling home up the themes, must add that to my bucket list. I have followed your adventures for a long time now, and they have always inspired me. Following the death of my best friend and partner in crime for over 40 years. I am getting my arse back into action. I ahve a few things planned. (camino de santiago next May) South downs way this year and few after work micro adventures. probably on the downs as I live in worthing. I am thinking my weight limit should be around 15kilos with tent (1 man) and sleeping bag, bits and bobs. I want to do most things with this weight so that I can adapt for the camino. Thanks for all you do and the inspiration seeds that yu spread. I’m sorry about the loss of your friend. I think the South Downs will be great for getting you fit, and getting your head right too. I’d recommend about a 50litre pack. You will be OK with a 2 season sleeping bag, plus a woolly jumper or two if necessary. Better to have a light bag and top it up with layers than to lug around a massive heavy bag in the summer. I’d like to take my 8 yr old on a wee rambling, over night trip, somewhere within 3 hours of London. I just don’t want to have to put up with people moving us on at 3am, as this will scare my kid. Dartmoor and the Lake District are just too darn far to make a weekend of it. Hi Chris, in all of my nights away near London I have never ever been moved on. And certainly one hour after dusk everyone has gone inside by then! Go for it! Central line tube out to Epping and have a wander along the Essex Way. Start of the route is almost opposite the station. I’m brand new to this but have done a lot of walking (staying in pubs etc). Am really excited by bivvying but also nervous about safety. I’m a 45 year old woman and will likely be going on my own. Any tips for staying safe overnight? I don’t think you’ll have any problems. I’d suggest picking a site or two just by looking online, find somewhere a short distance from a nearby town or village. Anna McNuff has some good pointers – https://annamcnuff.com/2014/09/18/adventures-around-london/ – and then go there while still daylight (if possible). Check out that your site’s still feasible, and if so, retreat to the village pub for some food, and a couple of bevvies. Head up there after dark, settle down, and aim to be up and gone, leaving no trace, by before 7, when any dog walkers may be around. I think you’ll find that the feeling from it will make you feel 10 feet tall, and after the 2nd time you’ve done it, any worries will be completely gone. Phoebe Smith is another inspiring resource – http://www.phoebe-smith.com/ – great book too!